NETWORK UPDATE: The NBA FINALS adjusted up to 7.6 in final numbers, and the pre-game primetime JIMMY KIMMEL LIVE fell correspondingly to 0.9. In addition, the rerun of THE SIMPSONS gained 0.1. CABLE HIGHLIGHTS: The hand-wringing about all the terrible things that happen on GAME OF THRONES certainly isn’t hurting the ratings, as its season finale was up 0.49 from last week to 4.14, which was also up 0.33 from the 2014 finale. (It barely missed out on being the show’s highest-rated episode ever, down 0.05 from this season’s premiere.) SILICON VALLEY rode that wave to 1.15 for its own season finale, up 0.09 from last week. VEEP was up 0.12 from last week to 0.53, and LAST WEEK TONIGHT lost a tick to 0.59. On Showtime, PENNY DREADFUL (just renewed for a 3rd season) fell 0.03 to 0.19, NURSE JACKIE dropped 0.08 to 0.20, and below the supplemental chart, HAPPYISH slipped 0.02 to 0.07 (with 224K total viewers). AMC’s HALT AND CATCH FIRE gained a hundredth to 0.15. CHINA IL (Adult Swim) fell a tenth to 0.48. WGNAmerica’s SALEM dropped 0.03 to 0.07, with 314K total viewers. The highest rated sports telecast was Fox Sports 1’s NASCAR coverage at 0.73. The unscripted realm was led by E!’s BOTCHED, up a healthy 0.19 to 0.67. Its lead-out RICHKIDS OF LA was up 0.02 to 0.35. 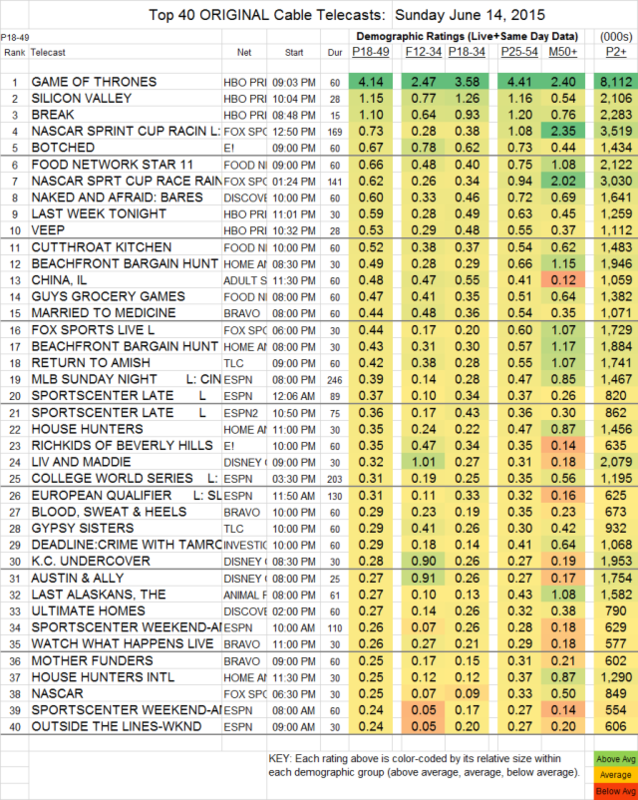 FOOD NETWORK STAR was at 0.66, and lead-out CUTTHROAT KITCHEN was at 0.52. Discovery’s NAKED AND AFRAID took a 0.25 hit to 0.60. On Bravo, MARRIED TO MEDICINE lost 0.08 to 0.44, BLOOD, SWEAT AND HEELS fell 0.09 to 0.29, and FASHION QUEENS also dropped 0.09 to 0.15.